Product prices and availability are accurate as of 2019-04-20 18:19:07 BST and are subject to change. Any price and availability information displayed on http://www.amazon.com/ at the time of purchase will apply to the purchase of this product. Fashionable but yet practical, medical replacement bracelet. 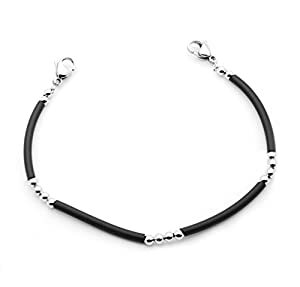 This bracelet features black silicone with silver beads. This is made on a stretchable strand for ease of getting on and off. Clasps are stainless steel. This bracelet is very dainty, and picture can make it appear larger than actual. STRAND Measures 6 inches and an APPROXIMATE total of 7.5 inches when our (1.5") ID tag is attached (other tag lengths may vary). ****Available in a total of 6.5" (youth/small) or 8.5" larger adult. If you wish to receive either of those sizes YOU MUST MESSAGE AFTER PURCHASE. Tag Sold Separately This is fashion Jewelry and not intended for wear in Showers, oceans, pools, or hot tubs.